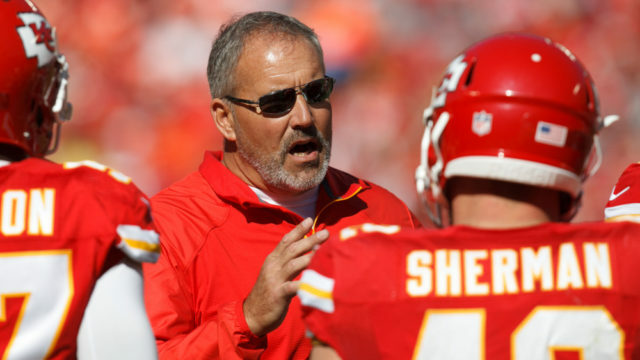 The San Diego Chargers Sunday made Kansas City Chiefs special teams coordinator Dave Toub the fourth person they interviewed to fill their vacant head coaching position. The 54-year-old Toub has been the Chiefs special teams coordinator since 2013 after holding the same position with the Chicago Bears from 2004-2012, when the team had an NFL-high 22 kick return touchdowns. Toub began his 16-season NFL coaching career as the Philadelphia Eagles special teams quality control coach in 2001, a position he held for three seasons. Toub began his coaching career in 1986 at the University of Texas El Paso as a graduate assistant. He was the Miners strength and conditioning coach from 1987-88, a position he held at Missouri from 1989-98. He was the Tigers defensive line coach from 1998- 2000. The interviews began Thursday with Tampa Bay Buccaneers defensive coordinator Mike Smith, a team official said. New England Patriots defensive coordinator Matt Patricia and Carolina Panthers defensive coordinator Sean McDermott were interviewed Saturday. Smith is the only interviewee with NFL head-coaching experience. He was the Atlanta Falcons head coach from 2008-2014, posting a 66-46 record, reaching the playoffs four times, including advancing to the 2012 NFC championship game. The Chargers have been seeking a head coach since firing Mike McCoy less than two hours after they concluded a 5-11 season with a 37-27 loss to Kansas City Jan. 1.